The "ACKNOWLEDGEMENT OF DELIVERY" service in the Pashupati era. Dr.Hellrigl's and Mr.Shrestha's important discovery, published in POSTAL HIMAL nr.42 (2ndQuarter 1985), lays the foundation for the interpretation of registered covers franked with more than 6 annas providing the key to determine if the additional postage concerns the cost for overweight or the due for an "Acknowledgement of Delivery" service. To facilitate, I cite from POSTAL HIMAL nr.42, page 15: "... at the end of Dr.Hellrigl's report on the "Regional Meeting in Kathmandu" he mentioned the important discovery reported by Mr. S.L.Shrestha concerning the reason for seemingly large amounts for postage on some registered letters, stating that "After checking several registered letters bearing 7 annas or more, I found a surprisingly high percentage were indeed marked acknowledgement due". He now reports to us the Nepalese inscription for this service: पहुच पाउने = PAHUCHA PAUNE ...". 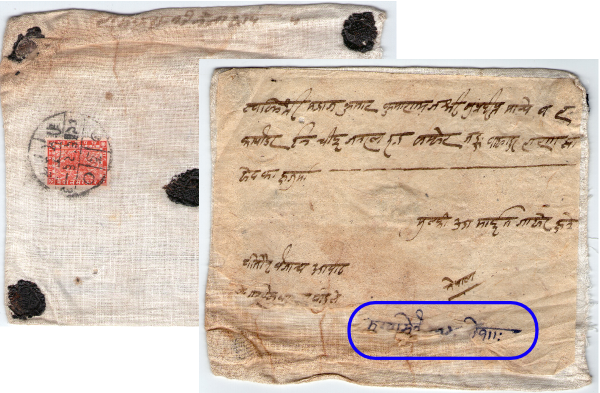 The statement made by Dr.Hellrigl and Mr.Shrestha for the classic period appear to applicable also for the Pashupati era, although I've noticed, checking my Pashupati covers, that the spelling of the inscription has over the years slightly changed from the original: पहुच पाउने = Pahucha Paune to the more modern style: पौच पाउने = Paucha Paune. Furthermore, I have observed that during the Pashupati era the use of the complete inscription is rather rare. Much more frequently is the usage of an abbreviation: पौ.पा.= Pau.Pa. With all this in mind I was very surprised to find the mentioned acknowledgement abbreviation: पौ.पा. (Pau.Pa.) 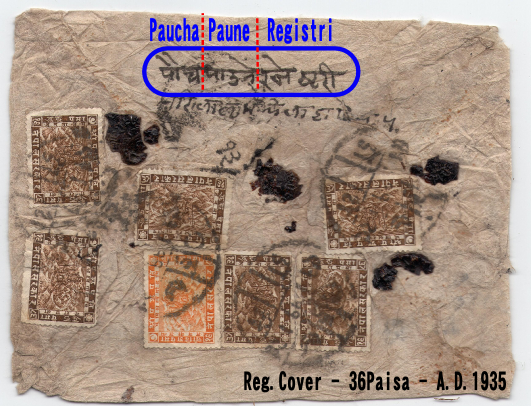 also on a recently obtained 8-paisa cover posted at Udaipur and dated 1931. I had expected to see the usual postmaster's weight notation: "Tola 2" to justify the additional fee of 4 paisa, but instead of this the cover is marked: "Tola 1 - Paucha Paune". I have to admit that I never thought possible any sort of association between unregistered standard letters and the acknowledgment service, but these cover seems to generate the doubt that during the Pashupati era the Nepalese post has provided an acknowledgement service also for unregistered standard letters at the additional cost of 4 paisa. Although the pictured cover represents already a considerable indication, so I think that the matter requires a much more accurate investigation before it can come to a reliable conclusion. 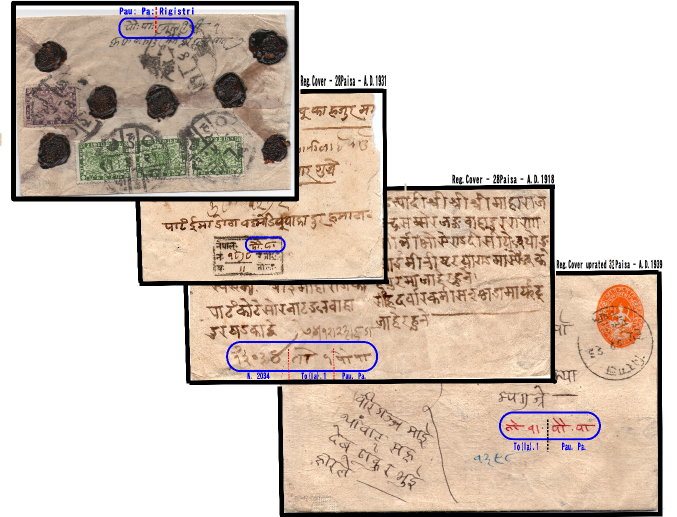 Therefore, I would ask the collectors, which have 8-paisa covers dated prior to 1936, to consider the kindness to check their items in view of an acknowledgement service annotation. Of course, also any other sort of comment, correction or additional information is very welcome. POST SCRIPTUM: I would add two additional covers. 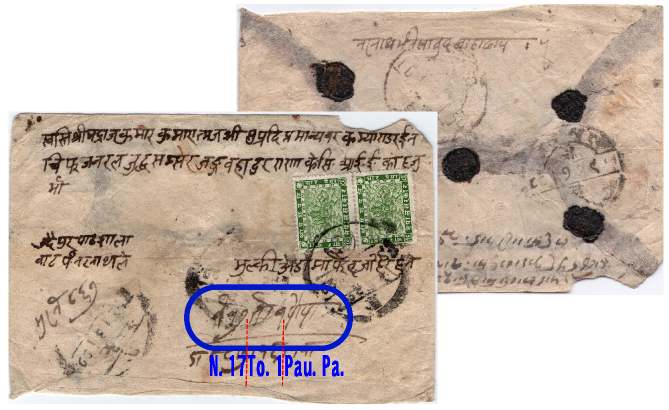 My first reaction in terms of the upper Udaipur cover was - and essentially I suspect it even now - that one is a normal registered letter which has lost a stamp, even though my eyes can not detect any traces of glue.